This is a video clip that makes the Tesla and electric vehicle crowd very happy. 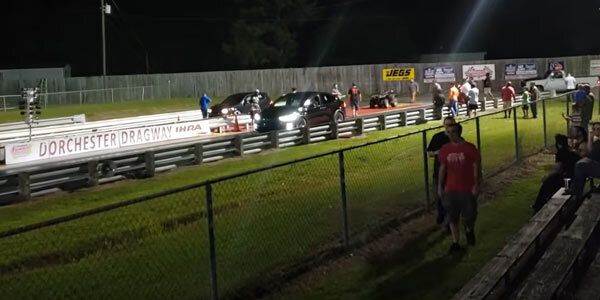 An 1/8-mile drag race between a 2018 Tesla Model X P100D in Ludicrous mode, up against a bunch of muscle cars and even potent four-cylinder cars. The Tesla wins convincingly over the other vehicles, but the problem is there’s lots of caveats when a high powered electric car goes up against a petrol/gas driven equivalent in a short drag race. On the surface the Tesla is a clear winner, electric beats petrol, but for starters, they are completely different beasts with completely different characteristics. A bit like putting up a rally car against a Formula One car, different setups and optimized for different uses. Electric motors have more instant torque/power, petrol ramps up the power slower but keeps going up, which means over an 1/8-mile drag race a Tesla will have an advantage, almost optimized for this distance. If the race was over a longer stretch, then the results would be different. The main overriding factor here is that a race like this is still comparing apples and pears. If you pitted a jet car against a Tesla and the jet car won, it would be classed as just a great bit of entertainment. But as the electric car is constantly being compared to the petrol equivalents in all areas and as what we will be using as vehicles in the future, each electric car win helps justify the electric car owners and prove they are the way forward. This obviously feels a bit of a kick in the kahunas for the internal combustion engine, but it’s not doing too badly for a 100+ year design. Therefore, videos with electric cars up against other performance vehicles is great justification for the electric crowd, but the race is weighted in their favor. A short distance, instant torque and even electronic launch controls which will work the best going to an electric engine are favorable in a short distance drag race. One other point is that like any high-performance vehicle, you have to pay top dollar for the Tesla – $140,000 MSRP. A Challenger SRT Hellcat starts at $64,295. So, you would expect that level of performance from a Tesla costing twice the amount, Electric or gas. The Tesla won, but was twice the cost to do so. For the majority, what you get for the money is a huge factor, so at least for the short term, you are definitely paying extra to buy into the latest electric vehicle technology. One things for sure, the gas powered vehicles can refuel and get home with their feet up in front of the TV before the Tesla has recharged its battery packs. The Tesla can also flap its wings quietly in Celebration Mode, but it will never be able to roar like the internal combustion engine. A bit like watching the end of a great concert, but with the sound down. Comment below with what you think of this drag race. Related ItemsTesla vs. Muscle Car: Unfair?